Zara Shahjahan returned to catwalk after indeed a long hiatus but her return was truly worth all that wait. 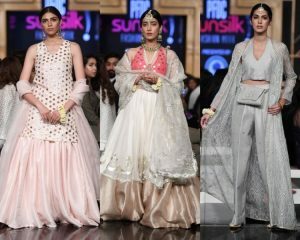 She showcased exceptionally pretty outfits with traditional silhouettes worked with gota, kamdani, zardozi and other embellishments of the same ilk. ZS’s collection —that mainly featured angrakhas, chooridars, ghararas and flowy, long kurtas— will be available for retail soon.